Compare female deodorants from Mum, Mitchum, Norsca, Dove, Rexona and Nivea on their effectiveness, smell, value for money, packaging and overall customer satisfaction. 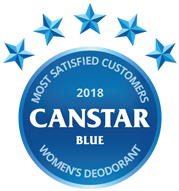 Mum has topped Canstar Blue’s customer satisfaction ratings for female deodorants in 2018. It scored five stars for smell, value for money, packaging and overall satisfaction. It earned four stars for effectiveness. Deodorant probably isn’t the most glamourous item in your bathroom or handbag, but we all know it’s a necessity to help you stay fresh throughout the day. No one enjoys bad BO, especially after a workout or a stressful day at work. But what’s even worse is getting that little black dress stained by deodorant – it’s a lose-lose situation sometimes. With this in mind, there’s certainly a wide range of brands available, so if your current deodorant is letting you down at the most crucial times, we’re here to help! Canstar Blue has surveyed over 1,000 women to find out which brands keep us gals happy and provide long lasting effectiveness – from the office, to the date night. 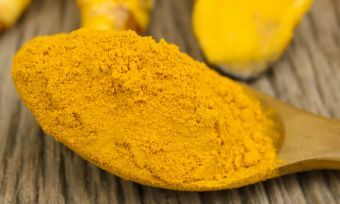 Brands were put to the test on a range of critical factors, including effectiveness, smell, value for money and packaging as well as overall customer satisfaction. 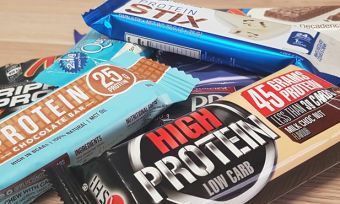 Six brands received the minimum sample size to be included in our ratings, but only one achieved five stars overall – Mum. Mum was rated number one for overall satisfaction as well as for smell of product, value for money and packaging. It also received four stars for effectiveness. Mitchum and Norsca got four stars overall, while Dove, Rexona and Nivea were left with three stars apiece. 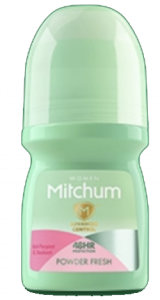 Mitchum was the only brand to achieve five stars for effectiveness. 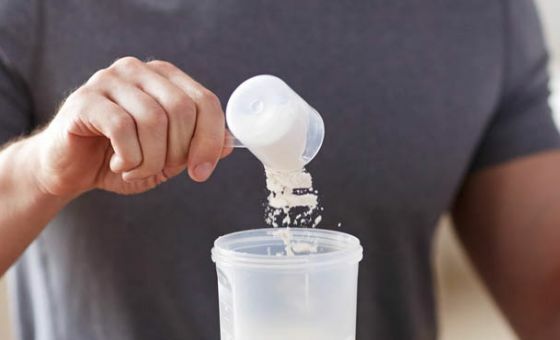 What to consider when buying deodorant? Effectiveness is evidently the biggest factor when buying deodorant and it makes sense – why bother with deodorant if it doesn’t do the job. Smell was the second most important factor, and it’s evident from our ratings that some brands are better than others in this department. 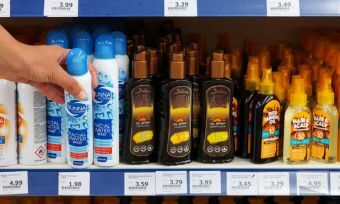 The survey also found that more than half of women (52%) always buy the same brand of deodorant, while 19% buy the cheapest brand. According to our research, almost half of women (48%) purchase roll-on deodorant, while spray came in second with 44%, followed by stick deodorant on 6%. It typically comes down to preference as to which type you buy. It’s important to note that our ratings include feedback on all of these deodorant types. A third of respondents to our survey (32%) indicated they didn’t know there was a difference between deodorants and antiperspirants, which means some people might be buying the wrong product. While many brands boast 2-in-1 combinations, deodorants and antiperspirants target two separate problems. It’s a common misconception to think that sweat smells. In actual fact, sweat itself is essentially odourless – it’s the natural bacteria on our skin reacting with sweat that releases the smell we call body odour. So the primary goal of deodorant is to mask the smell of excessive bacteria, while antiperspirants aim to prevent sweating. The brand Mum was born way back in 1888 and has been rolling its way through the years on a global scale. It offers roll-on (50ml) and spray options (100g), which are all boasted to be 2-in-1 antiperspirant deodorants, plus alcohol free. Fragrances include ‘Cool Pink’ and ‘Dry Active’, stated to be light and delicate to not clash with perfume. While Mum does have fragrances for men, these aren’t sold in Australia. Mum was a stellar performer in this year’s review, with five-stars for overall satisfaction, smell, value for money and packaging. It was four stars for effectiveness. Throughout Mitchum’s 50+ year history, its main goal has been effectiveness. Mitchum Clinical is available in a variety of fragrances for both women and men, boasting 2-in-1 antiperspirant deodorant with 48-hour protection. It’s claimed to be dermatologist tested and contain aloe and vitamin E to help soothe and condition. The range includes roll-on (50ml), stick (45g), powder (45g) and gel (57g) options. Mitchum got four stars overall, as well as on smell and value for money. It was an outstanding five stars for effectiveness, backing up some of its claims, but just three stars for packaging. Available in a range of fragrances for men and women, Norsca antiperspirant deodorants are aimed to combine cool, fresh, exotic and soothing scents to “awaken your senses”. While it does have roll-on options, the women’s range only features three sprays (150g) – clear passion flower, sport and baby powder. Its sport variant is boasted for 48-hour protection with no added alcohol or colourants. Norsca received a respectable four stars overall and for all other factors, making it a consistent performer in our 2018 review. A brand owned by Unilever, Dove says it is committed to helping Aussie women realise their personal beauty. Dove offers roll-on (50ml), stick (45ml) and spray (169ml and 250ml) deodorants, some being a 2-in-1 antiperspirant option. According to Dove, there’s a product to suit every situation, such as ‘Clinical Protection’, boasted to deliver up to 48 hours of protection and ‘Invisible Dry’, claimed to leave no white marks on more than 100 colours. Dove’s antiperspirant deodorants are also created with ¼ moisturising cream. In this year’s review, Dove got three stars for overall satisfaction and effectiveness. It was four stars in all other categories. Another brand owned by Unilever, Rexona provides deodorants for both women and men. Its options include roll-on (50ml), stick (45ml) and spray (250ml). Rexona boasts its invisible Black+White range to protect clothing from stains, while its ‘MotionSense’ technology is said to help with excessive sweating. Fragrances range from apple and pear to light, floral notes. It also features a hypo-allergenic formula with a low scent. Rexona scored three stars overall, plus three stars for effectiveness and value for money. It was a respectable four stars for smell and packaging. German personal care brand Nivea features a wide range of deodorants – for males and females. Its women’s line-up includes roll-on (50ml) and spray (150ml and 250ml) options. It boasts a number of different formulas from ‘Pearl & Beauty’, stated to feature pearl extracts to support an even skin tone, to ‘Pure Invisible’, which is claimed to protect against white marks on clothes and underarm skin. Nivea also offers its ‘Sensitive Protect’ roll-on deodorant, specifically developed with chamomile extract and avocado oil for sensitive skin, according to Nivea. In 2018, Nivea got three stars for overall satisfaction, as well as in most other categories. It was four stars on value for money. customer satisfaction, via ISO 26362 accredited research panels managed by Qualtrics. 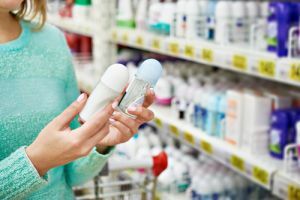 The outcomes reported are the results from customers within the survey group who have purchased and used women’s deodorant from a supermarket or pharmacy (excluding body spray and perfumes) in the last 3 months – in this case, 1,232 people.